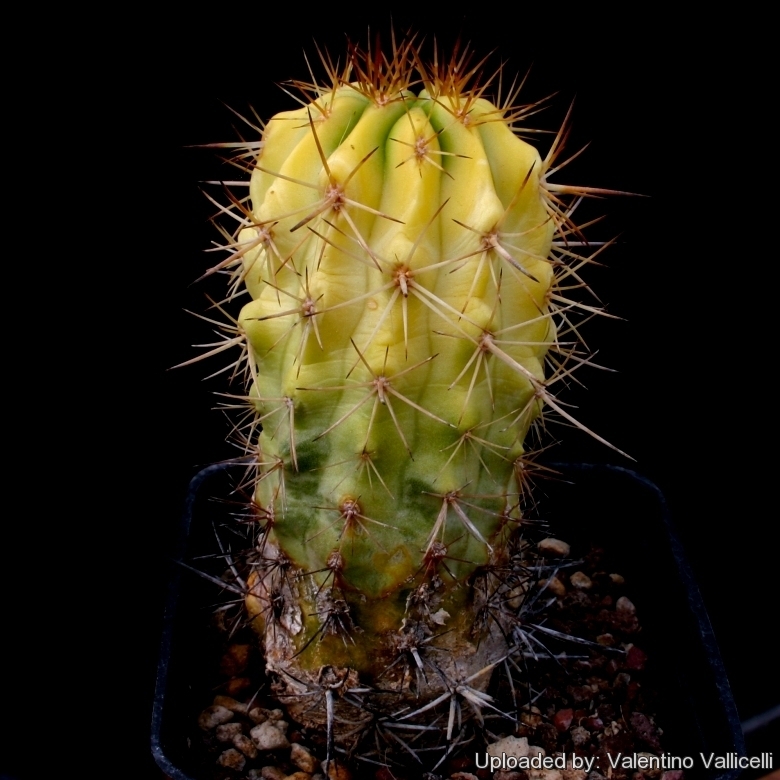 Description: Variegated Copiapoa are very rare in cultivation and some of these variegated plants are very priced by collectors. All variegates are mutants. Something has gone wrong with the cellular structure of the growth tip (apical meristem) of the plant. As a result of this mutation, chlorophyll is missing from some or all layers of the plant epidermis. The odd variegate appears in many seedling batches in a small percentage (especially among hybrid seeds) and are generally separated from normal plants. Variegated plants grow slower and are generally smaller than non-variegates of the same species. Coloured areas are also generally weaker, and more susceptible to fungus, sunburn and other defects. A large well grown variegate Copiapoa is truly an achievement. These are harder to grow well than they appear. Habit: Caespitose that branches profusely, forming large clumps. Ribs: There about 13 tuberculate ribs with a rounded, raised edge and a wide base. Areoles: Apical, 5-8 mm diam, depressed or convex, covered with short wool when young, later glabrous about 0,5-0,8 cm, 2 cm apart. Radial spines: 8-10 fairly slender or slightly curved horizontal, honey-amber, brown or black becoming gray with age. Central spines: Absent or one or two thicker up to 3cm long. Roots: Roots-strong, long, thick, narrower at top. Flowers: Campanulate 3 cm long and grow from the center of the white wool at the apex. Outer segments of the perianth are linear and greenish; inner segments are wide, blunt and yellow.